Oahu is one of the best places in the world to take your vows. The turquoise water, the beautiful sunsets, and the sparkling sand will ensure that you cherish you wedding ceremony forever. Numerous options are offered by Oahu wedding planners and you can personalize your wedding and reception in several ways. Wedding planners take care of every aspect of the wedding from the accommodations to transport. Read on to find out about the ways in which an Oahu hawaii weddings planner can make the most important day in your life more beautiful in Oahu. If you wish to get married on the beach, the perfect spot is Waikiki. Some people opt for the Ala Moana Beach Park or the Waialae Beach Park. Ala Moana Beach Park is situated in Honolulu. The 'Magic Island' can be seen from this beach, and what's better, you can actually tie the knot on a grassy knoll with the sea in the background. Waialae Beach Park is suitable for those who prefer more secluded surroundings. Those who wish get away from the din and bustle of cities often choose the Waimanalo or Waimea beaches The Waimanalo is thirty minutes away from Waikiki, while it takes about an hour to get to Waimea. Ask your Oahu wedding planner to provide suggestions regarding selection of the venue. If you fancy lush green surroundings, then the Kualoa Mountain Range near the Diamond Head Crater is just the place for you to say 'I do'. Many guests also marry in one of the numerous gardens and resorts of the island. Some of these sites have alternative facilities for reception of guests even in unfavorable weather conditions Cuisine from different parts of the world is available at Oahu. Have a chat with your wedding planners to find out what options you have. If you wish to tie the knot in Hawaiian tradition, you may have a Kahu, i.e. a minister to guide you and your partner while exchanging vows. Often couples also choose to have conch blowers and Lei greeters during the wedding ceremony. Let your Oahu wedding planner know what you want, and it will be taken care of. 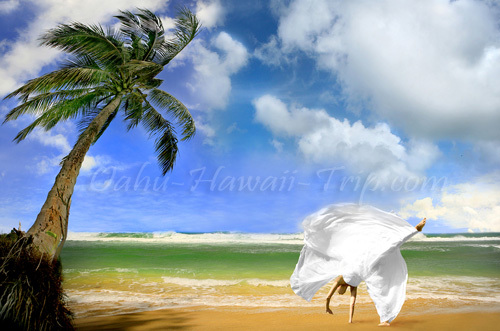 An Oahu wedding planner can arrange for Hula dancers and Hawaiian Musicians to entertain you during the reception. The Hawaiian trio with the steel drum guitar, the ukulele, and the stand-up bass is also quite popular. If your guests wish to party, you may arrange for a disc jockey or a local Rock 'n Roll, Hawaiian, or Jazz band. The best part of getting married in Oahu is that you can stay on in this tropical paradise for your honeymoon! Share Your Oahu Weddings or Romantic Vacations: We're looking for stories, experiences and tips from any romantic Oahu Hawaii vacation or getaway you've been on. Why not take a few moments and Share it with everyone!